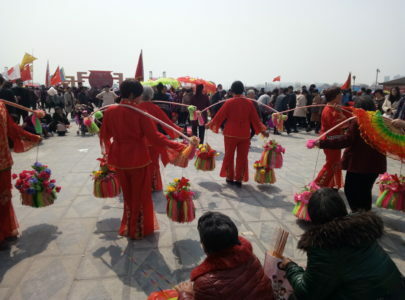 Thursday’s longish ride destination was decided by Steve- Huaiyang for their annual festival. The way out of town surprised us with newly torn up streets. Zhoukou is in a constant state of flux. I thought they’d finished with those improvements after construction last year, but no. 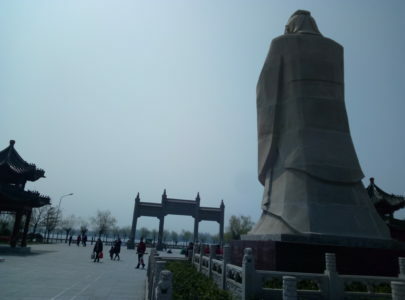 The day was beautiful and after back roads into Huaiyang we stopped in to visit Confucius at his temple on the island. 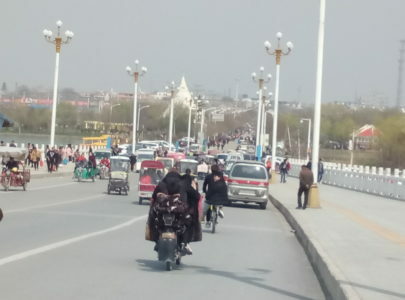 The map in my head made a previously not-understood connection (I used to always get lost in Huaiyang) and we rolled over the bridge and into the huge main event plaza. Last year was our first time to the festival, and it was overwhelming. There were dancing groups of retired women, camel rides, get your picture taken in traditional costume, baby animal ring toss prizes, and lots of toys. Turtles, rabbits, birds, etc. are popular spring-time gifts. I can’t vouch for their life span. 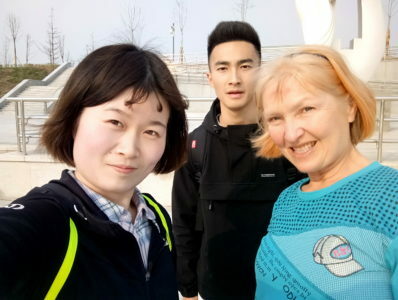 Chinese women, especially but not exclusively retired ones, and a few brave men enjoy “square dancing.” There are themes and competitions for this form of group dance. There is very little social dancing at clubs or parties. I’ve never heard of it happening in Zoukou. The traditional festival snack consists of large amounts of something akin to refrigerator biscuits, the interest in which escapes me. Maybe it’s a throw-back to the times of scarcity. 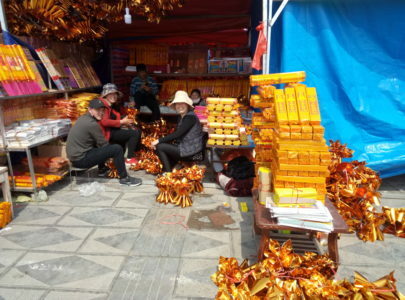 And there was a large area dedicated to the sale of folded gold paper facsimiles of “treasure” to burn for the ancestors at Fuxi’s nearby temple. It’s warmed up, again, and I was looking forward to more nice long rides in the country this week. It hasn’t even been windy or rainy. So what kept me from more miles? Strangely extra-achy joints. On the Big Tour, the only time my knees bothered me was after four hours of dancing on Khaosan road. The knees aren’t what they used to be. After a few days they’d settled down and didn’t pose any unusual problems for the rest of the tour. So what was going on this past week? I don’t think I can blame it on the new yoga class taught by the Shaolin monk, though it was bent-knee and quad intense, that hasn’t bothered in the past. Was it the changing spring weather? Maybe, I probably have some arthritis in there. After the Huaiyang ride I was back for my regular yoga class featuring the hamstrings and some splits-like poses. Whatever the cause, the next day it was hammies turn to sing the pain chorus. I am not usually so afflicted. Saturday I taught extra classes, so I didn’t ride much, and was looking forward to Sunday for big miles. So Saturday night what did I feel? An oncoming sore throat, which has blossomed into a full-scale nasty cold. I did ride a few miles without a mask Friday, when the air was in the “moderate” range (about as good as it gets). Could that have done it, as it has in the past? Or is it simply a cold? And what was with the achy joints and muscles? Years ago I suffered from extra-achy knee joints and I discovered that cutting out nearly all high-glycemic and processed foods and most dairy from my diet improved my knee pain by a large margin. Here in China I don’t have as much choice in the types of food I buy. Whole grain varieties of noodles, rice and bread are virtually unknown in Zhoukou, and my special green smoothies are harder to make. 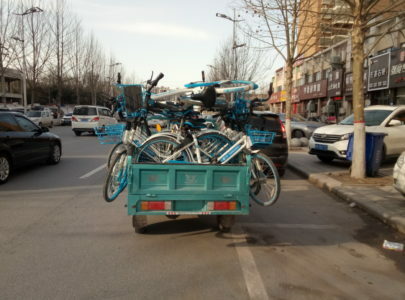 Here you see Hellobikes being moved around to where they are needed most, near campus. At least I managed a shortish ride of about 18 miles with students on Hellobikes along the river. 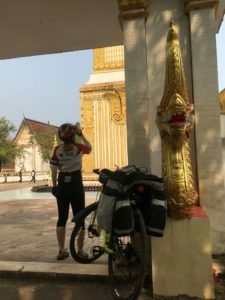 They are athletic, so they managed well (though slowly and with saddles too low) on bikes not intended for longer trips. Neither had been on a bike for quite some time, not keeping one at school, so the bike shares allowed them an opportunity to ride they would not have had otherwise. While annoying, a week of low miles won’t kill me, and I should be back on the road soon. Hoping you bounce back quickly.